Learning to whitewater guide on Chile's Rio Futaleufu isn't for everyone. The river is one of the most difficult commercially run rivers in the world, a test of any guide's river running, verbal, and decision making skills. The river requires technical maneuvers in big water unmatched by any commercial runs in North America. Guiding on the Futaleufu blends strategies of big water rowing while simultaneously commanding a paddle crew in big, technical Class IV and V whitewater. 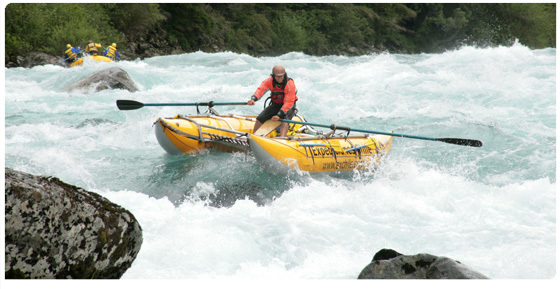 A competent Futaleufu guide has the ability to adapt quickly and guide on any river in the world. Early morning arrival in Buenos Aires. Change airports and catch another flight to Bariloche Argentina. From Bariloche, a luxury bus can take you on a beautiful drive along the Patagonian lakes and mountains to Esquel. It is 20 minutes taxi ride from the bus station to your hotel in Trevelin. Trevelin, Argentina is a Welsh mountain village just 45 minutes from the Futaleufu River in Chile. Trevelin is also serviced by a private transfer service direct from Bariloche airport (4 hrs) to your hotel in Trevelin. After you check into a hotel in this charming village you are walking distance to several superb restaurants. Unwind, relax, and get a good nights sleep before the start of you trip 9:00 am the next morning. Our guide school program starts on the Class II/III Rio Espolon. Here we orientate ourselves to the rafts and equipment. We will then outline paddle rafting strategies concerning command of the crew and control of the raft with stern mount oars and paddle crew. Before we move onto whitewater, we go over the fundamentals of the "Triangle Safety System" and learn about the job of safety kayaker and safety catamaran. In the afternoon, we put into practice what we learned on the "El Macal" section of the Rio Futaleufu, hitting each eddy on opposite sides of the river as we zig-zag back and forth through the section. Each student will have a chance to change positions in the raft, and experience every part of the raft. We return to the camp for a summary of the information presented and dinner at our Campo Tres Monjas. We return this morning to the "El Macal" (Class III) stretch of the Rio Futaleufu giving each participant an opportunity to man the oars and command the raft. This will be the final warm up before putting in at the Class IV sections of the Rio Futaleufu. Before moving up to the Bridge to Bridge section we will review the strategies of the run and decide who will start on the oars and the catarafts in the afternoon. The Bridge to Bridge section requires the team work we have developed on the easier sections below. Afterward we will return to camp for a lecture on the specifics of each rapid and what could be improved using video taped analysis. We will spend both the morning and afternoon rafting on the Bridge to Bridge section, going over all that we have learned in the previous two days and mastering our river running techniques. Participants will be involved in setting up safety and develop decision making skills. We will rotate all participants so that each gets a turn on the oars and safety cataraft, if they so desire. At the end of the day we will do a swim test of all the participants in anticipation of the Class V runs to come. This evening we will do a video review of the runs, discuss river running strategy and diagnose problems. We will spend both the morning and afternoon rafting on the Bridge to Bridge section, going over all that we have learned in the previous two days and mastering our river running techniques. Participants will be involved in setting up safety and develop decision making skills. We will rotate all participants so that each gets a turn on the oars and safety cataraft, if they so desire. At the end of the day we will do a swim test of all the participants in anticipation of the Class V runs to come. We will also go over stratagies for just paddling rafts. This evening we will do a video review of the runs, discuss river running strategy and diagnose problems. We will discuss the action plan for the following day of rapids and how to get the team around the two rapids we will portage. We take our entire class for an early morning descent of the world class "Infierno Canyon" (dependent on water levels). This descent will require the best efforts and attention of the entire team. If the water is too high we will put in just below the Infierno canyon. We will ghost raft the Class V "Zeta" and the "Throne Room" rapids. Afterwards we run the chaotic Wild Mile. This time of the year this run is Explosive continual class 4 plus action that is stimulating to the maximum. We will take out at Camp. Graduation ceremonies will begin before dinner and carry into the always fun award ceremonies. Day 8 Friday: Terminator & Casa de Piedra and on to Trevelin, Argentina. Full on fun! We start at Campo Tres Monjas as we head down for a complete descent of the lower Futaleufu; 21 kilometers of challenging whitewater. We group scout the "Terminator" as our team threads the needle. After this Class V rapid, we continue to rotate our team through the oars increasing the your time guiding oars. This day is a full day of rafting, taking out after the "El Macal" section, passing the technical Class V "Casa de Piedra" and "Mas o Menos" rapids. Our vehicles will be waiting at the end of today's run. Our luggage will join us as we make our way toward the border on our way to Trevelin. Check into your hotel, take a shower and change clothes before enjoying your last night in Patagonia. There are several outstanding and reasonably priced restaurants in Trevelin that we can recommend. Relax, recover and look back on the exciting week of training before heading back the following morning from the Esquel Bus station or Airport. We start at Campo Tres Monjas as we head down for a complete descent of the lower Depending on your connections you are now are in Argentina ready for an early departure in a cab from your hotel to the bus station in Esquel for the trip to Bariloche and your flight back to Beunos Aires. A private transfer can be arranaged direct from your hotel to the airport in Bariloche. If you have a flight from Esquel you have the morning to enjoy and buy gifts in Trevelin before your 2 pm flight to Buenos Aires and the connection back to your home country. Included: Your described trip, guiding, instruction, activity equipment, local transportation, shuttles, all meals, acomodations at our eco-camps, cabins, ranches or lodges, while on your trip. We offer a free pick up on Sunday mornings at 9 am in Trevelin at your hotel, and drop off to your hotel in Trevelin, Argentina on Fridays at 9 pm. See the packing list of your activity, for the specific clothing that is required. Not Included: Transportation to and from your home town, and your accommodations and meals in Trevelin Argentina or alternate trip pick up point. You can reserve and prepay on the web your transport from your final air destination, to and from your pick up-drop off point before and after your trip, or you can direct us to charge your visa card and do it for you. We higly recommended having exchile make hotel reserves in Trevelin. (room capacity in this small village is limited). Expediciones Chile is not financially responsible for your travel complications getting to your trip pick up point and from the drop off point, HOWEVER, we will be relentless allies in offering our services to help solve any issues that you may encounter. Patagonia Adventure Travel, Chile Rafting & Argentina KayakSafaris Torres del Paine trekking and FitzRoy trekking vacations. Patagonia travel information, Patagonia Tour Guidebooks and Maps of Patagonia . Info about Chaiten, Puerto Montt, Bariloche and Esquel. Information about weather in Patagonia, climate and precipitation patterns. Sea Kayaking Chile from the Andes to the Ocean on Lago Yelcho. Fjords, hotsprings, extinct volcanos, temperate rainforest. Whitewater Guide School Thinking about a whitewater guide job on the Futaleufu? 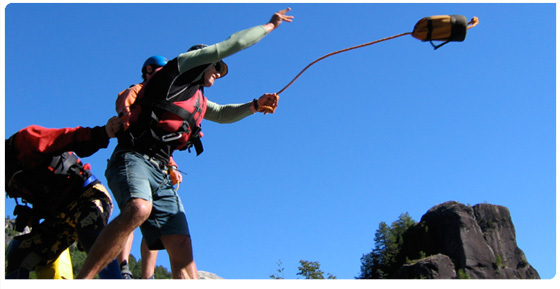 Check out our whitewater guide school & swiftwater rescue training courses. Custom ecotours in Chile of the Futaleufu valley that include bird watching and nature treks. Learn the kayak eskimo roll and receive world class kayak instruction from our paddling school. Checkout our large group, instructional and corporate team building programs offered every year..
Trekking Torres del Paine Tours in Cerro FitzRoy and Los Glaciares national park and the Futaleufu River. Information on visiting Chile. Travel agency commisions and discounts. Experience a Horseback riding vacation like no other with genuine Gauchos &Chilean Criollo horses. Our CondorNest Ranchito is the perfect honeymoon vacation spot located beneath the spectacular Tres Monjas towers. 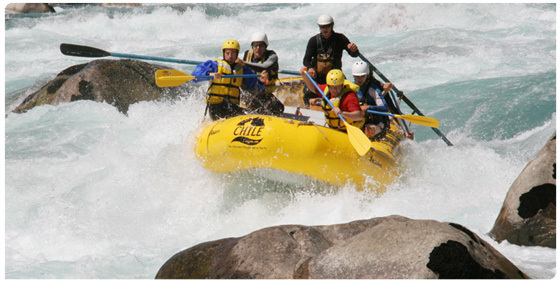 Office internships and employment opportunities in rafting, kayaking and fly fishing & adventure travel offfice. Experience genuine Chile Culture Immersion on our adventure travel horseback riding and trekking vacations. Experience a genuine Patagonia mountain biking vacation from our lodge or eco camp.